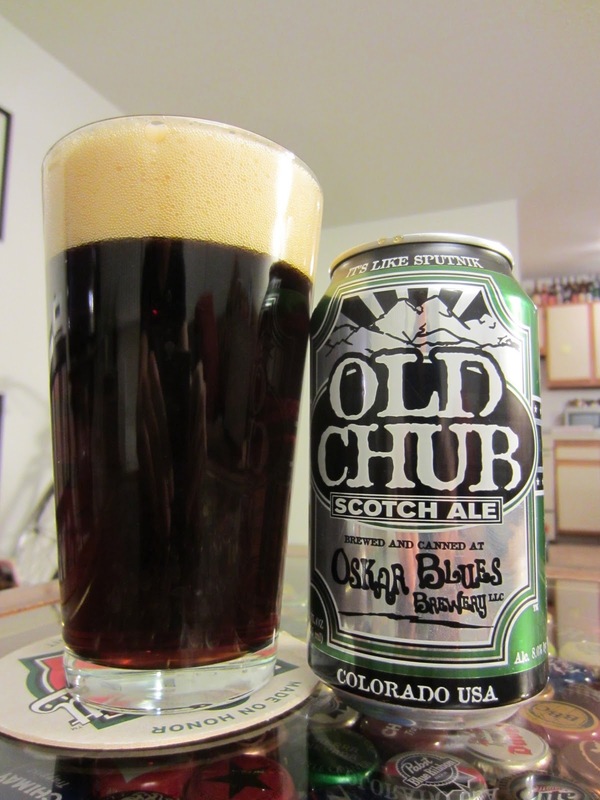 Old Chub, a Colorado-brewed Scotch Ale or Wee Heavy, pours a deep rubied brown body with a medium-large light brown head. The beer's foam is moderately creamy in appearance with healthy bubbles of air. The head fades slowly and leaves light lacing on the glass. The nose is malty, but light. Toasted malts are sweet with caramel and a light sugary candied edge. Very mild earthy tones underscore the brew's malt base. A sip reveals, not unexpectedly, a sweet malt body with almost no hops perceptible. Mild candied stone fruits lend additional sweetness to the toffee caramel and contrast light coffee-like flavors. The beer is straight forward and malt-centric, true to the style, but not an overbearing malt bomb. Highly drinkable with a light robustness, this is a classic session ale. The finish is drying with hints of hard water and a bit of lingering sweetness.